(Aug. 24, 2018) -- San Antonio is one of the fastest growing cities in the country and filled with excitement. All three UTSA campuses are near the easy-to-navigate freeway systems and both are near thriving tourist areas. Also, remember the VIA buses run to (or near) almost all of these places. There is so much to do, here are a few Roadrunner favorites. Okay, this one’s pretty obvious. It’s practically next door to the Main Campus. If you’re not familiar, it’s home to classic thrill rides (you must brave the Wonder Woman Golden Lasso) and a huge water park. There’s also fireworks every night to help you appreciate that big Texas sky. Also, look for special features at Halloween and Christmas. The Roadrunner Express in the Student Union sells discounted tickets. If you want to step off campus for a bite to eat and you want to keep it casual, check out The Block on Roadrunner Way. It’s a picnic-style park with gourmet food served in a rotating group of food trucks to cater to your every craving. Also, free wi-fi! There’s nothing to take the edge off like some retail therapy and lucky for you, UTSA’s Main Campus is surrounded by shopping centers. The Shops at La Cantera is just across the street and up the road is The Rim. Both centers have new stores and traditional favorites. You can also cross UTSA Blvd. for the food trucks at The Block. Enjoy something new without really leaving Main Campus. If you desire a unique adventure stop by Couleur + Blinde Boutique, 4704 Broadway Street, 78209 and meet Project Runway All Star winner and designer, Anthony Ryan, San Antonio’s homegrown super fashion-star. For fun retail and entertainment experiences near the Downtown Campus, visit Southtown and The Pearl. Southtown merchants host a special event on the first Friday of every month and it includes all the food, music, art and evening entertainment you would want. It happens on South Alamo and around the Blue Star Art District. The Pearl area off Broadway and Graysen Streets includes one of the most famous hotels in the world, The Hotel Emma. These merchants host a special event night on the First Thursday of every month. You can pick up some healthy eats on this night at the Pearl Farmer’s Market, catch local musicians, and special in-store deals. Make sure you also plan a meal at the Pearl eateries such as Southleigh’s, Cured and Bakery Lorraine. 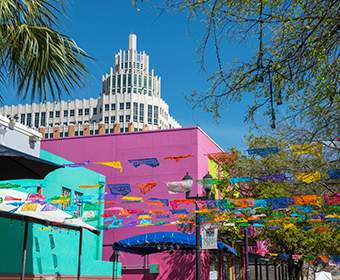 Also, not far from the Downtown Campus, plan an outing to the King William District to view classic architecture and breakfast at the Guenther House; or visit Market Square and the traditions of Mexican merchants with meals served at the famous Mi Tierra 24/7. Short on time? Dine in at Pico de Gallo, just across from campus on Buena Vista Street. If you have a special occasion coming up or just some extra money to burn, UTSA is around the corner from iFLY, an indoor skydiving facility that allows visitors to “fly” in a wind tunnel. It offers the experience of skydiving without actually, you know, jumping out of an airplane. While many people think of Texas as a desert, Roadrunners know better. There are plenty of green spaces to embrace, and the best one near UTSA’s Main Campus is Leon Creek Greenway Park. It’s a beautiful multiuse trail just five minutes from campus, great for hiking, biking or just a quiet stroll. If you’re a Downtown Campus student, try some study time at the beautiful Travis Park across from the historic St. Anthony’s Hotel. UTSA’s Main Campus is just a few minutes away from Topgolf, where you can eat a burger topped with fried mac and cheese while also playing golf and enjoying a majestic view of San Antonio. For those near the Downtown Campus wanting to hit the links, head up Highway 281 north to Quarry Golf near the Quarry retail area… You can golf, eat, shop and take in a movie all in one place. First of all, make sure you visit the UTSA Institute of Texan Cultures located on the Hemisfair Campus. Enjoy learning about the many cultures which make up Texas history. Take in exhibits, festivals, and performances scheduled throughout the year. An added bonus—UTSA students, faculty and staff get in free with a UTSA ID. If the Lyric Theatre doesn’t have any performances around the corner, catch a play or a musical down the road at the Woodlawn Theatre, a non-profit community theatre that puts on classic plays and musicals each month. The most unique theater in the state is the beautiful Majestic and Empire Theatres near the Downtown Campus. Go early to enjoy the features before your show. San Antonio is also known for its museums. Spend a day visiting the Witte Museum, The McNay Museum or the San Antonio Art Museum to see creativity at its best. Have a kiddo in the family? Check out the DoSeum, a favorite of the young and young at heart. The Alamo isn’t the only historic site in San Antonio—far from it! The San Antonio Missions are a World Heritage Site featuring a trail of four Spanish frontier missions that are hundreds of years old. Each is uniquely beautiful and they make for a fun, inspiring day. San Pedro Springs Park is located in downtown San Antonio. Surrounding the source of the springs, the 46-acre park is the oldest in the state of Texas. The iconic San Antonio River Walk is downtown and lined with restaurants and merchants to visit and entertainment to enjoy. This is a must-visit during the holidays and each spring during Fiesta. Also, take in the Starving Artist Show featuring local talent. Are you hungry for more sports on top of the exciting teams at UTSA? Then perhaps a team with five world championships will suffice… the San Antonio Spurs! Need we say more? Put on your silver and black and cheer for the home team. The Alamo City is also home to the San Antonio FC soccer team and the Missions baseball team. Find more fun things to do in San Antonio. Find more UTSA back to school information on the Welcome, Roadrunners page.